Fourth of July is a lot of fun. Summer is in full swing, the cool water of the pool beckons and celebrations peek around every corner. Of course, the whole family wants to participate in the festivities. When it comes to your pet, however, you can take certain steps to ensure they stay safe, healthy and happy. 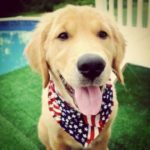 Read on for some important tips on keeping your pet safe for the July 4th holiday. Leave your pet home and secured safely inside if you head out to a fireworks display. Along the same vein, keeping your pet home won’t allow for them to run or escape if they are frightened by loud noises or excitement. At home, they’ll have a safe and familiar place to retreat. Be sure your pet’s identification tag is up to date and secure on them. Should your pet happen to get lost, an identification tag is your best line of defense. If someone finds your pet, an up-to-date tag will help return them to you, safe and sound. You should also double check their microchip to make sure their registration information is up to date and correct. This can provide valuable information if your pet is found as well. If your pet does not have a microchip or you are unsure if they do, you can speak with your veterinarian about microchipping. Be careful around citronella products. No one likes mosquitoes and citronella products can certainly help with those pesky insects. These products, however, can be harmful to your pet. They may cause respiratory distress and, if ingested, serious gastric problems. Keep your pet away from the barbecue. It’s not really 4th of July without a cook-out, some sparklers and pretty fireworks. Your curious pet may be interested in the fun, too! Having your pet near the grill or around fireworks and sparklers can be hazardous for them as they can incur some pretty serious burns. Know where your pet is and try to keep them away from these hot items. Also, keep an eye on what your pet is eating, since some friendly guests may be generous with their food. Be aware of the temperature. As with the rest of the summer, July can be incredibly hot. If you are going to walk your pet, try to keep their walks in the early morning hours or later in the day when it is a little cooler. Also, be sure to mind their paws on the hot pavement.